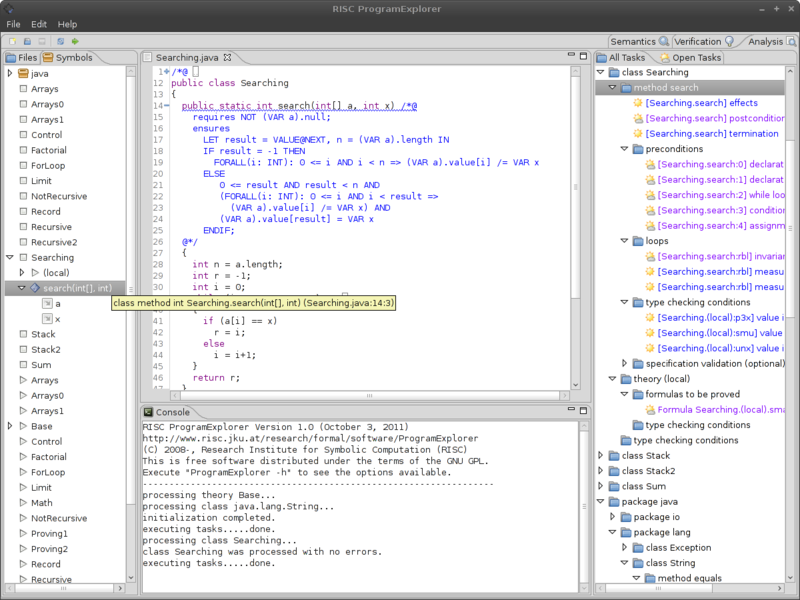 The RISC ProgramExplorer is a computer-supported program reasoning environment for a simple imperative programming language "MiniJava"; it incorporates the RISC ProofNavigator as a semi-automatic proving assistant. The environment has been developed mainly for educational purposes (see this paper for a sketch of the main ideas). The software runs on computers with x86-compatible processors under the GNU/Linux operating system; it is freely available under the terms of the GNU GPL. Click to run Flash screencast. Click to enlarge screenshot. To start the software, login as user "guest" with password "guest", double-click the "Terminal" icon, then execute "cd examples-ProgramExplorer-CVC3" and "ProgramExplorer &". 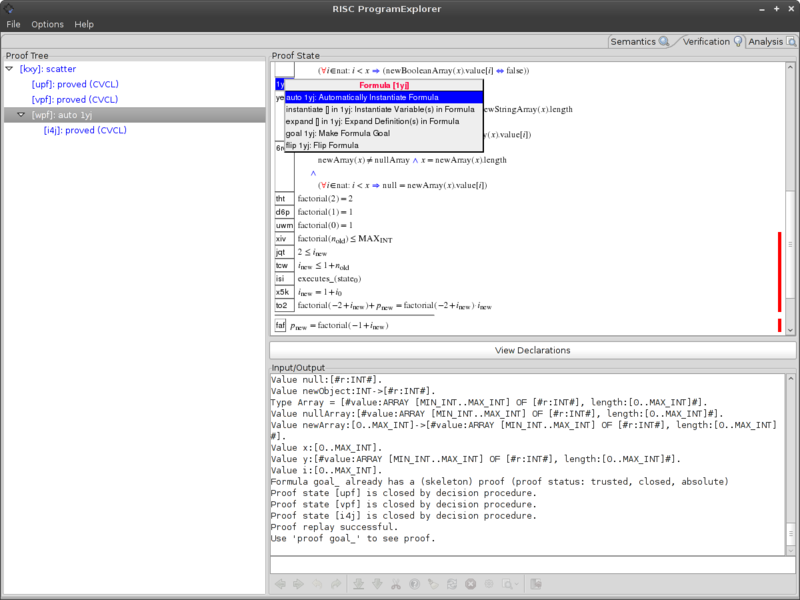 As a small demo, double-click the class "Factorial" in the left panel, then right-click the method "fac" and select "Show Semantics" to investigate the semantics of the method as a relation on program states. This is the user documentation for the software (see the separate manual for the RISC ProofNavigator on how to use the proving interface). 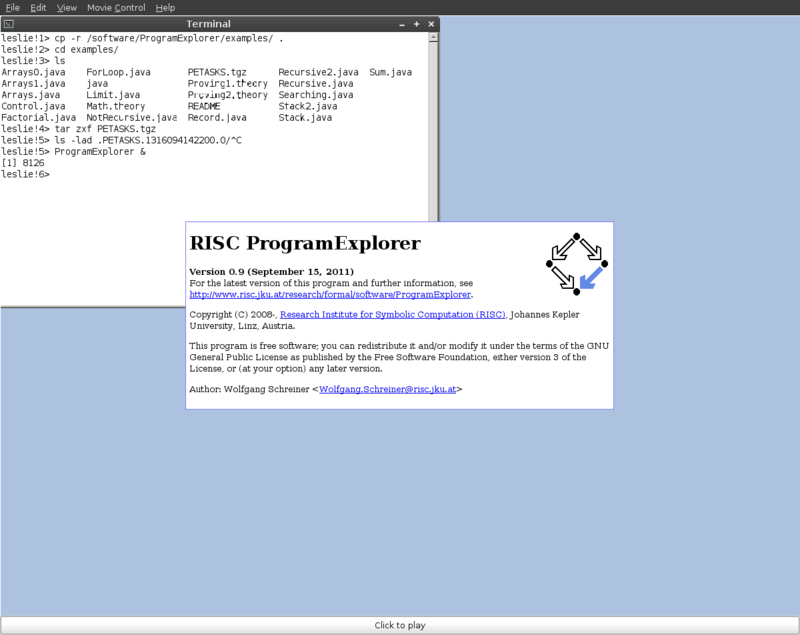 Collected information on the RISC ProgramExplorer.